ROAD TOWN, Tortola, VI – The trumpet continues to be sounded for Premier Dr The Honourable D. Orlando Smith (AL) to give up the position as Minister of Finance. The latest call has been made by former BVI Ports Authority (BVIPA) Managing Director Mr Claude O. Skelton-Cline, who believes a re-shuffling of the National Democratic Party (NDP) Government is warranted. “I think what needs to happen if you talking about good governance to turn this train around, there needs to be a shuffling and re-shuffling of our entire government,” Mr Skelton-Cline said on the CBN Channel 51 show, Vigilate Dialogue, with host Shania M. Smith on Monday June 5, 2017. As the guest of the local show, Mr Skelton-Cline and Smith were discussing various aspects of Governance and highlighting a number of issues that has gripped the territory because of the lack thereof. Skelton-Cline suggested that Premier Smith may not be the best person in Cabinet to handle the Minister of Finance portfolio. “We have a challenge here in our territory where our Minister of Finance Dr The Honourable D. Orlando Smith, who is a good man, who I think was one of our first surgeons here who had done a tremendous job in his primary work as a medical physician. He later ran for office got elected two or three times and has now became the leader of the country. The very vocal Skelton-Cline who currently has taken legal actions against the NDP Government for not renewing his contract as promised use the Bahamian Government as an example that Premier should follow. 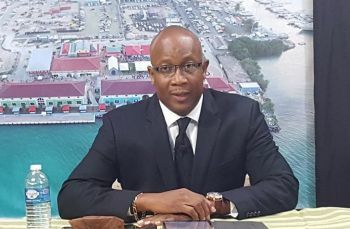 Mr Neil M. Smith was sent on vacation for two months from sometime in March after coming under serious fire for Premier Smith’s release of inaccurate information to the public. He has since been replaced by Mr Glenroy A. Forbes, a story first and accurately reported by this news site. Mr Skelton-Cline insisted there is a major communication problem in the government that is causing a major break down of the territory. He went as far as to accusing the government of caring only about holding on to an office. Meanwhile, former legislator and strong NDP supporter Mrs Eileene L. Parsons OBE had first recommended, in a letter to the NDP, that the portfolio of finance be given to Hon Ronnie W. Skelton (AL). Then chairman of the BVI Health Services Authority (BVHSA) John I. Cline had publicly supported Mrs Parsons suggestion but this upset Premier Smith, who demanded the resignation of Mr Cline. Putting everything else aside, you making a whole lot a sense here. MR Cline tell the public why you never come forth before if you were in your former position your lips would have been tights seal. You are no better than them. He was a good Finance Minister when he was cutting his checks as a Consultant and otherwise though. Ah boy! When the cruise ship project was in Swing and Doctor Smith was signing for Loans for C O C and is cronies to spend and over Spend,he was a good Finance Minister then..Now being on the outside peeping in C O C talking down the Doc..We all in the BVI loose site on reality too easily..
Claude - by your OWN logic and reasoning being that O.S does NOT have the requisite skills/training/experience/qualifications to be our Minister of Finance; then the same should be held for you and YOUR case that you have before the courts! You have NONE of what you claim O.S. has neither, yet you were given a cushy high paying (over $100k/yr) job that you now feel as if you were ENTITLED to it! Same Government you calling for a reshuffle are the same gangsters you were laying in bed with so to speak and praised over and over again. The Hypocrisy in this small as you called it 2x4 place is mind blowing to say the least! So why were you a loyal soldier to this disfunction and now making noise. If you were really genuine you would've addressed these issues when you were in the camp not after they removed you. That's my 1st reaction. After I get past that, everything you said makes sense. A Pastor who spent most of his life in Detroit was tipped to be a Consultant on Port and Cruise Ship issues. His prior experience in that field? NONE!! Pastor further tipped to be Director of Ports Authority, charged with oversight of ALL BVI Ports and at the time, overseeing the $80mil pier park project. His background or experience with engineering, construction, tourism, ports or marine industries? NONE!! He is a fine one to be talking. This man is an example of majority of the people who are complaining about NDP or Government this and that. When the Government does things in their favor then its fine. When they are on the outside looking in and can't get their way any longer, all of a sudden they are speaking publicly as if they care about the country. Where was Claude when people were crying out about the pier and he was just shoving it down people's throats? We have a set of hypocrites parading this place pretending to be patriots! When them start to say Good Morning, Good Afternoon and Good night then talk to me. The PS is the one who truly runs a ministry. Maybe the PS in the MoF needs to be qualified in economics or such the like. So the question becmes: Is the sitting PS qualified in the field, or any related field that would make him a true asset to the Ministry and our 'mis'qualified Minister? As much as I do not like America and its politics, I agree with how they choose their Secretaries. They select persons qualified in the particular field for each post. We can not get away from the elected officials being unqualified in the ministries to which they are assigned, but can not we do something about how the other posts are filled? The NDP has an 11-2 advantage in the HOA. Nonetheless, its bench is weak though the government critically needs a reshuffling. Hon Skelton is the go to member but he can only serve in one ministry at a time. In addition to being the Minister of Health and Social Services, he can effectively serve as Minister of Finance or Minister of Communication and Works or Minister of Natural Resources and Labour or even Minister of Education & Culture. Be that as it may, Ronnie should be appointed Minster of Finance with Marlon as Junior Minister and Orlando Minister of Health and Social Services. From there, it just a roll of the dice with no clear cut choices. Archie can probably go MCW. Kedric probably MNRL. Myron MEC with Delores as Junior Minister of Culture. Mark???? Cline seems to have made a career of getting government funds and is not sure what to do without it because I suspect he feels entitled. Detroit paid him and were broke. VIP paid him for a project never completed as far as I know. And NDP paid him as a loyal soldier until he wasn't loyal anymore. He is part of them problem and needs to be gone to ponder his ways as well not to be pining for a new party or VIP to recruit him. He will deny it but he has a "I can't say no" problem. Most ordinary BVI citizens will undoubtedly think he has more legitimacy now.